Lately I’ve been on a preserving kick, making jams and jellies, putting vegetables in the freezer and at the moment, gathering everything up for some homemade pickles. Everything I’ve done this year was to preserve something I had around the house, or was given, or had too much and needed to save some. 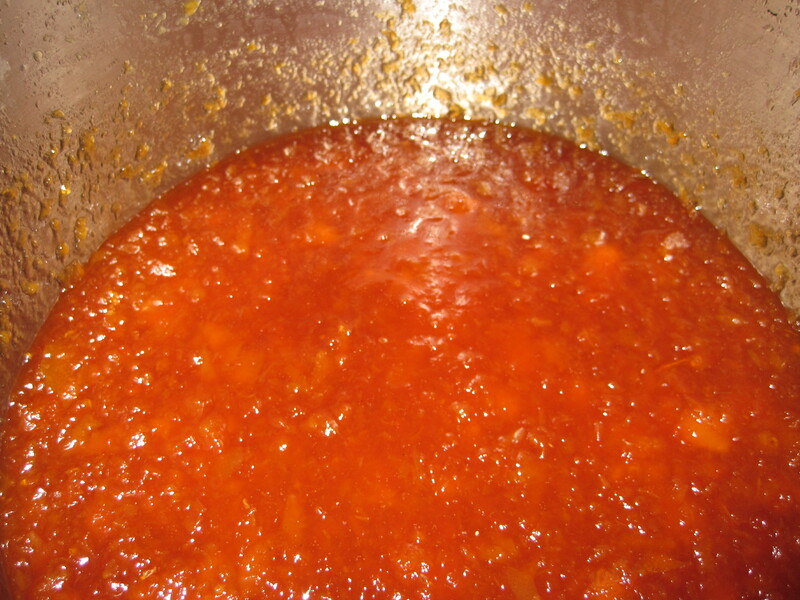 Yesterday I saved 7 over ripe ruby red grapefruit from the trash can by making grapefruit jam. I love a good grapefruit and I figured people make jams, jellies and marmalades out of everything else, so why not try it. Turns out it is delicious! You could make this recipe with any citrus fruit, or a combination of several different ones. Like everything else I do, this was easy and well worth the try. First you need to section the grapefruit. 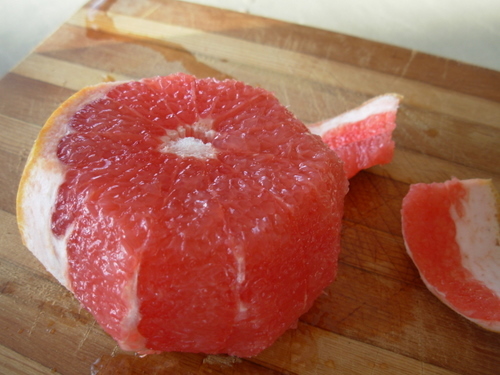 To do that, cut the ends off so your grapefruit will have a flat area to sit on. 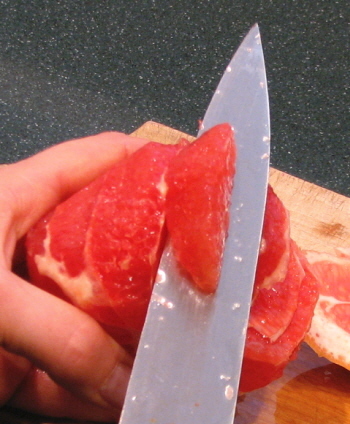 With a sharp knife, go all around the grapefruit removing the skin. This is also how I peel cantaloupe, watermelon, oranges, honeydew melons.. anything with a round shape you’d like to peel easily. After you’ve removed all of the skin, using a sharp knife, work in between the membranes to remove the segments from the pith. Work over a heavy bottom sauce pan so that all of the juice and fruit pieces fall into the pan. Then squeeze the juice from the membranes before discarding them. Be sure to remove any seeds that may have fallen into the pot. Measure out the amount of fruit/juice you have before cooking (my 7 grapefruit yielded 4 cups of fruit and juice). Bring the fruit mixture to a boil over medium high heat. Once boiling, add half as much sugar as you had fruit (for my 4 cups, I used 2 cups of sugar). Continue to boil until sugar is dissolved. Next add 1 pack of liquid fruit pectin. They say you don’t need it with grapefruit, but you do. Then add 1 tbsp butter (this keeps foam from forming on the fruit mixture while it’s boiling. Continue to boil at a rapid boil (one you can’t stir down) for at least 10 minutes. As the grapefruit get hot, they change in color to a beautiful golden orange mandarin color. This is what your mixture should start to look like. To test, put a saucer in the freezer to chill, then take a spoonful of the jam mixture and spread on the plate. If it sets up and doesn’t run you’re ready to can. If it runs, continue cooking longer. To can the jam, get whatever size jars you’d like to use (I used 8- 1/2 pint jelly jars because that’s a good size to give out to friends). In another stock pot, bring water to a boil. Boil the jars, rings and lids to sanitize them. To can the jam, get a jar from the hot water and set it on a plate. 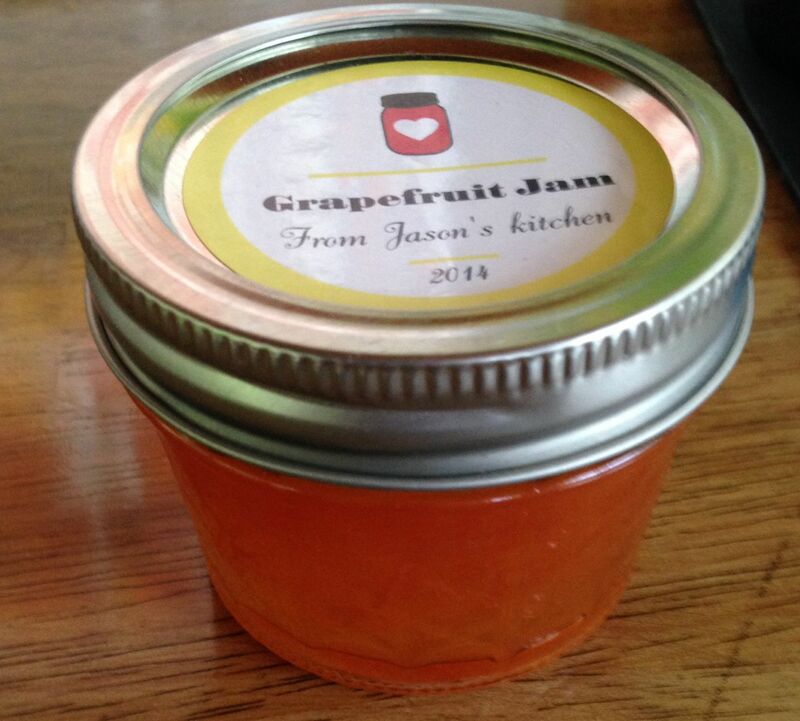 Spoon the jam into the jar, leaving 1/4″-1/2″ head space at the top. Place a top on it and crank on a ring. Once you’ve filled all of your jars, drop them back into your pot of boiling water, ensuring the tops of the jars are covered, and process for 5-6 minutes. Remove from the hot water and let the jars cool on a towel or in a box. As they cool, you’ll hear them seal. They will “pop” all night. Now you’re ready to share or enjoy. Once you’ve opened a jar and broken the seal, be sure to refrigerate it.